This meal was full of so much win that I don’t know where to start. First of all, I found the recipes on Pinterest, a “virtual billboard” that lets you point people to interesting products and ideas you find online. Yes, other sites let you do the same thing, but Pinterest does it with pictures. Pretty, pretty pictures. I have a Pinterest board called Enticing Eats where I pin links to foods that I actually plan to make. Ambitious? Yes. Impossible? Not so far. 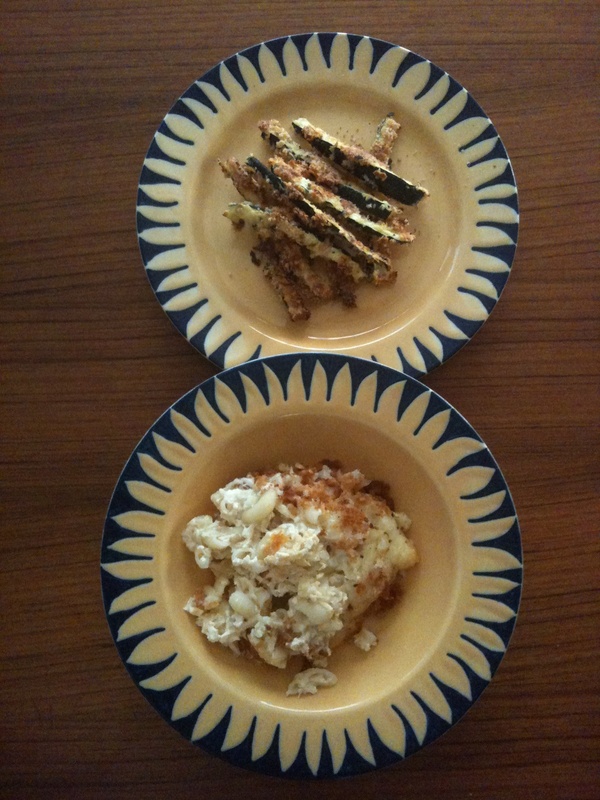 Two recipes caught my eye within a couple of days of each other: Slow-Baked Mac and Cheese and Baked Zucchini Fries. The macaroni and cheese called for the slow cooker, a promising release from using the oven or stovetop on these 90-plus-degrees days. The zucchini fries had to go in the oven, but I used my small countertop convection oven, which gives off less heat. Best of all, I got to use up some zucchini from the CSA box. As an aside, when I leave Alabama, I want to move to a place where squash is not the default CSA vegetable. I halved the recipe for the macaroni and cheese simply because the original called for 12 ounces of Fontina cheese and my Publix only sold it in 9-ounce blocks. I could live with 3 ounces of leftover cheese a lot easier than I could live with 6 ounces of leftover cheese and a bill for TWO 9-ounce blocks of fancy cheese. Had I not halved the recipe, I would have had a lot more mac and cheese than I needed, although I guess it would probably freeze well. So far, we’ve eaten it for dinner on two nights and I have enough left for one of us to have a generous lunch. Likely me, since I seem to be in charge of consuming leftovers. The husband gave the dish the ultimate compliment: He said he would eat it again even if the slow cooker was a pain to clean (he’s appointed himself head washer of the slow cooker vessels since they’re so heavy and I’m so [ahem] dainty). It was creamy and cheesy, as expected, but the eggs gave it an unexpected casserole-like texture. I browned some homemade breadcrumbs (more on those in a minute) in a little olive oil and sprinkled them on top before serving. Fancy. The zucchini fries were an excellent match. The original recipe called for panko breadcrumbs, and I didn’t even have a container of regular breadcrumbs on hand. I took a few slices of bread out of the freezer and whirled them around in the food processor until they seemed crumb-ish, then mixed them with garlic powder, onion powder, salt and Parmesan cheese, as the original recipe advised. The breadcrumbs soaked up a lot of the egg mixture coating the zucchini fries, so I had a big mess by the end of the process. Luckily, I had sort of followed the author’s admonishment to lay out only a couple tablespoons of breadcrumbs at a time. So, while the fries could have been prettier and crunchier and more thoroughly coated with breadcrumbs, they were still quite impressive. They were the first thing the husband smelled when he came down the stairs, and he was one happy diner. The original recipe says to serve them with pizza sauce or ranch dressing, but they were delicious without any sauce whatsoever. Head to Pinterest and request an invitation (I can probably round up a few for readers who make a good case). Follow my boards to see the cool stuff I post and let me know that you’re posting cool stuff too. UPDATE: I made the zucchini fries again, only I rolled them in a paper towel to absorb excess moisture and tossed them in the oven while it preheated to dry them off a little more. I also sprinkled them with plain old store-bought breadcrumbs. With some of the moisture gone, they were crunchier.